It permits you to expel the FRP insurance in single tick and it utilizes distinctive methods to evacuate the FRP assurance. 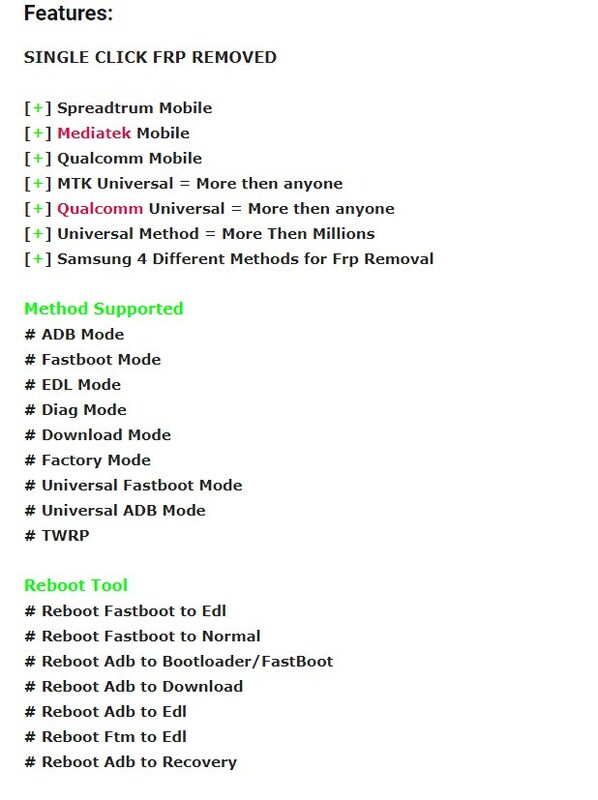 For Samsung gadgets, it utilizes four distinctive methods, and for the humanoid all comprehensive gadgets it utilizes in far more than 1,000,000 strategies to expel the FRP. It bolsters completely different methods for bodily function the FRP together with the ADB Technique, Fastboot Strategy, EDL Strategy, Diag Strategy, transfer Mode Strategy, process plant Mode strategy, TWRP technique. It to boot permits you to resuscitate the humanoid convenience together with resuscitating quick boot mode to EDL mode, resuscitate Fastboot mode to normal mode, resuscitate ADB Mode to Bootloader Mode, resuscitate ADB mode to transfer Mode, resuscitate ADB mode to EDL Mode, resuscitate FTM mode to EDL Mode, resuscitate the ADB mode to Recovery Mode.